NOTE: Customers outside the U.S. should order this book on www.bookdepository.com. This site ships FREE worldwide. Topics covered: The history of the discovery of cells, the molecule structure of phospholipids and phospholipid membranes, the cytoskeleton and its functions, motor proteins, ATP and the mitochondria, how the electron transport chain works, amino acids, proteins, DNA discovery, translation, transcription, mRNA, tRNA, ribosomes, chaperone proteins, lysosomes, enzymes, endoplasmic reticulum, Golgi bodies, docking proteins and protein synthesis inside endoplasmic reticulum, the structure of the nucleus, the nucleolus and how ribosomes are made, histones, nucleosomes, rRNA, cell metabolism, overview of digestion, chylomicrons, fatty acids, glucose, the Krebs cycle, acetyl-CoA, phagocytosis, pinocytosis, exocytosis, glycolysis, mitosis, meiosis, and overview of common body cells such as epithelial (skin, capillary, goblet, villi), muscle cells, neurons, bone cells and blood cells. Activities included: Fluid mosaic model, membrane simulations, motor protein pen craft, “Motor Protein Relay Race,” diffusion demonstrations, “Electron Transport Chain Relay Race,” protein pencil topper craft, tRNA cookies, hands-on activity about transcription and translation, “Roller Coaster Review” game, “Translation Relay Race,” lysosome simulation game, edible Golgi body models, DNA extraction lab, some virtual DNA labs (online), make a cell “mini-mural” from scratch, cell bingo (with challenging review game), “Respiration Relay Race,” mitosis flip book, “Jeopardy” review game, and edible models of blood cells. — You can still use the curriculum even if you can’t access the Internet links. The links are really terrific, but they are not so essential that you can’t do the curriculum without them. — Many of the concepts covered in this curriculum are considered “high school level.” However, they are presented in a manner that makes them accessible to younger students. The activities that go along with the text are a key part of making these concepts understandable to younger ages. Yes, it is worth it to gather the materials for the crafts and the labs! — You’ll notice that quite a few of the activities are group games such as relay races. This curriculum is ideal for doing with a group, but these group activities can be modified for use with just one or two students. Don’t shy away from using the curriculum just because of the group activities. — If you are teaching grades 8-10, check out module 1 of my Mapping the Body with Art ecourse. 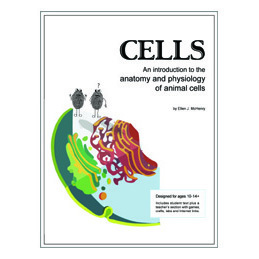 It’s not identical to this Cells book, and goes into more detail about cellular respiration, does a quick review of prokaryotes and has lessons on egg, sperm and zygote.